Has the Putin-Medvedev war begun for real? The president fails to endorse the prime minister's initiative and hints that the ruling United Russia party may not sweep the December elections. Russian President Dmitry Medvedev's failure to endorse powerful Prime Minister Vladimir Putin's "people's front" initiative is a sign of open confrontation ahead of the 2012 presidential polls, analysts said on Friday. Putin called last week at a ruling United Russia party conference for the creation of the All-Russia People's Front to broaden the party's electoral base with "non-party people," including trade unions, NGOs, business associations and youth groups. Some analysts see Putin's move as a bid to boost his United Russia party's flagging popularity and head off a potentially damaging poor showing in upcoming parliamentary elections. 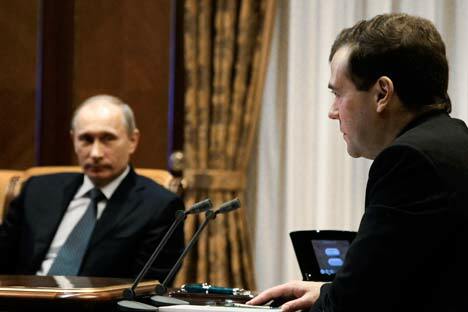 Putin, who heads United Russia without being a member, said on Thursday that Medvedev backed the idea. However, Medvedev later fell short of giving it his support, saying only that he "understood the motives" behind the move. "I understand the motives of a party that wants to keep its influence over the country. Such an alliance is in accordance with the law and justified from an electioneering point of view," Medvedev said in markedly lukewarm televised comments. Medvedev also suggested that United Russia's victory in the upcoming parliamentary election was not a foregone conclusion. "If everyone decides that things will follow a definitive scenario, then our political system does not have a future," Medvedev said, adding that "all the electoral battles still lie ahead." He stressed that political competition was vital, saying that "only then will our political system will be stable." "No one political force can regard itself as a dominant one, but any force should strive for maximum success," he said. Medvedev's comments follow a series of incidents in which the president appeared to criticize Putin over his statements on jailed tycoon Mikhail Khodorkovsky and Libya. These statements were seen in some quarters that Medvedev, widely seen as the junior partner in the ruling tandem, was beginning to assert himself. Medvedev later said that he would like to stay on as president after the end of his first term, increasing speculation that Russia could see a genuine power struggle in 2012. The People's Front project is "Putin's direct, unmistakable challenge to Medvedev, an incursion into a turf that is not his," independent political analyst Dmitry Oreshkin told RFE/RL Radio. "Under a bureaucratic code of conduct this is an open challenge because a subordinate [Putin] has no authority to prescribe tactics of action to his boss [Medvedev]. Now Medvedev will have to decide whether to join the People's Front and follow Putin or not to join and then what - become an enemy of the people?" "Obviously the two bureaucratic clans... have entered a phase of open confrontation in the face of the upcoming December elections." Gleb Pavlovsky, head of the Effective Politics Foundation, said in an interview with RSNnews that Medvedev's statements showed he "has rejected claims from a number of United Russia executives to the People's Front's role as the country's main political platform that will nominate a presidential candidate." However, some Kremlin watchers believe that Putin is still calling the shots. "No matter what, United Russia will nominate whoever Putin tells it to: If he says, Medvedev, it will be Medvedev; if he says, himself, they will nominate him; if he says, his BMW driver, they will nominate his BMW driver," said Vladimir Pribylovsky, director of the Panorama think tank. United Russia has been touting "Putin's initiative" as an inclusive, nationwide project for all political parties under its umbrella. About 100 NGOs are ready to join the People's Front coordination council, United Russia leader and lower house speaker Boris Gryzlov said, adding that this would translate into millions of rank and file members on a grassroots level. He described Putin's initiative as a "long-term program for our social development," stressing that it is "absolutely not an electoral project." He said, however, that the front could become a platform for nominating a candidate in the 2012 presidential election if it did well in the December parliamentary election.